Martha Stewart’s S’mores Bark | One Picture, A Million Words. After yesterday’s epic failure with my attempt to bake s’mores bars with homemade marshmallow creme, anything would be considered a success as long as it does not end up looking like a sorry mess. But look at these beauties, they are the complete opposite. Aren’t they pretty? The recipe for them is from the December 2010 issue of Martha Stewart Living. 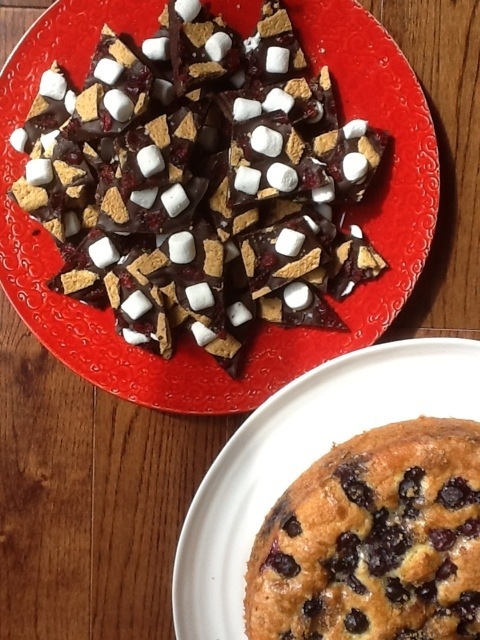 I added dried cranberries for a burst of colour and also, I wanted their tartness to provide a foil to the tooth-achingly sweet marshmallows. It worked! A super simple no-bake treat that comprises of only four ingredients. And everyone thought I was such a genius. The cake in the picture is a blueberry coffee cake that I make every year for my daughter’s birthday. It is her favourite cake and no wonder- moist and tender, it has layers of blueberries bursting with their juices and a crisp brown sugar topping to cap it off. My 13 month old son loves this cake too. His favourite fruit is blueberries and to be able to eat them in cake form – what a treat! My daughter’s birthday will always have a special place in my heart because I mark it as the day when this beautiful family of ours started. Happy birthday Lana! < Previous S’mores. Bars. Fail.